Today's content monetization systems encourage scapegoating on a massive scale. 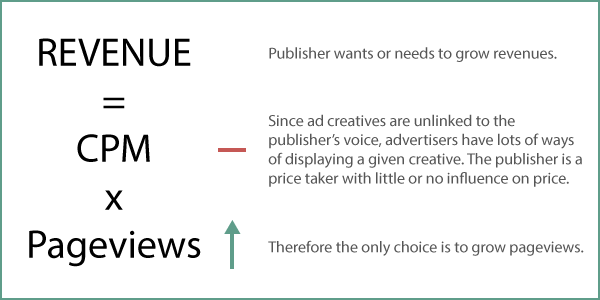 Conventional ad networks put creative control solely with the advertiser which means that a publisher's revenue has little to do with its reputation. 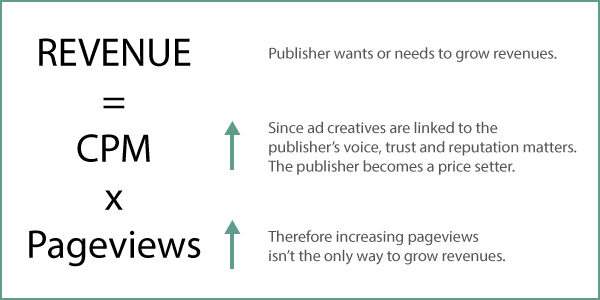 The only way a publisher can earn higher revenues is by increasing volume (pageviews) since the price (CPM) is more or less fixed by the market. The most reliable way of generating lots of pageviews is to create gigantic mobs. The organizing factor that defines a mob is a common enemy; a scapegoat. What we see today is competitive scapegoating at a world scale; happening in both obvious and subtle ways. One of the key ideas behind Adlove is to share creative control between advertisers and publishers. This bridges the gap between a publisher's reputation and its revenue and unsticks the price component of the revenue equation. So that's why I think Adlove is inherently good. It structurally downplays competitive scapegoating and incentivizes media companies to build trust by discovering new and important truths.